Jerry Bridges had been with the Navigators and involved in campus ministries a number of years. This book was first written in 1978 and my copy is an 1996 edition. I had read this some years ago but had not written a review. Since I am in a current study on walking with God, I read Bridges again and with much profit. 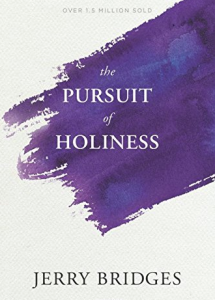 The book has 17 chapters but these can be divided into the first six explaining how God works in our sanctification and the remaining eleven explaining our responsibility in sanctification. The first part is the best in that he gives the reader a biblical basis for pursuing a holy walk with God. God changes us at salvation and gives us the tools necessary for our Christian life. He will not do it all for us, but He will enable us with these tools to succeed. The second part is a good application of our walk in areas such as our body, will, emotion, mind, faith, and joy. The reader will be able to see how Bridges wrote to college students who are faced with many temptations. His illustrations and applications are varied for a wider audience. Of the almost thirty books on walking with God that I have read in the past year, this is one of the best in terms of practical explanation and application.